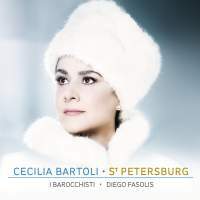 Clad in white fur, like a refugee from Dr Zhivago, Cecilia Bartoli stares out from the booklet cover of her latest musical archaeology expedition. Since her highly successful Vivaldi album, Bartoli has explored music libraries and archives across the globe, ferreting out neglected gems. Never one to rest on her laurels, Gluck, Salieri, Steffani and Caldara have been among the beneficiaries, as well as the unearthing of Baroque castrati arias and bel canto gems composed for Maria Malibran. Now, she travels to St Petersburg to discover Russian Baroque and the roots of opera there. Many of the musical treasures of Tsarist Russia on this disc are housed in the Mariinsky Theatre's archives and focus on the influence of three tsaritsas: Anna Ioannovna (1730‑40), Elizabeth, Peter the Great's daughter (1741‑61), and Catherine the Great (1762‑96). Anna was responsible for the first Italian opera company settling in St Petersburg and founding Russia's first academy of music. During Anna's rule, Francesco Araia of Naples became the first Russian court composer. Araia wrote the first Russian opera, although the two operas represented in this collection are both Italian. The pastoral aria 'Pastor che a notte ombrosa' from Seleuco has a charming oboe obbligato (played by Pier Luigi Fabretti). Elizabeth was responsible for bringing Hermann Friedrich Raupach to St Petersburg in 1755, becoming the new court composer four years later, after Araia's dismissal. Altsesta ('Alceste') was written to a Russian libretto and is represented on this disc three times ‑once by a swaggering March, dispatched with vigour by the excellent period‑instrument band I Barocchisti, and by arias for Hercules and Alceste. Bartoli is on terrific form here in her first forays in Russian on disc. Indeed, Hercules's rage aria 'Razverzi pyos gortani, laya' with its furious coloratura and martial trumpets should ideally have been the final item on the disc and not the second, given that I found it difficult to move on to the next track without repeating it. Bartoli throws herself into it with a vengeance and the results are thrilling. Alceste's aria 'Idu na smert', as the Queen of Thessaly faces death, is beautifully rendered, Bartoli spinning seemingly endless phrases out of nothing, ‑ Raupach's opera Siroe, re di Persia (in Italian rather than Russian) finds Bartoli tossing off ornamentation like nobody's business in Laodice's aria 'O placido il mare' against an orchestral backing full of tempestuous strings and throbbing theorbos. Vincenzo Manfredini is a composer represented from Catherine the Great's reign, with two arias and a closing chorus from Carlo Magno ('Charlemagne'). Carlo's 'Non turbar que' vaghi rai' contains some beautiful singing, along with a liquid flute obbligato, (from Jean‑Marc Goujon), while Desiderio's ,aria 'Fra' lacci to mi credi' features Bartoli's familiar fierce attack. Domenico Cimarosa was another composer active, although less successful. His 1788 opera seria La vergine del sole features an attractive aria for Idalide where a solo clarinet (Corrado Giuffredi) takes the spotlight, just a few years before Mozart would use the instrument (a good deal more spectacularly) in La clemenza di Tito. All of Bartoli's famliar traits as a singer are here, including those often cited by her detractors. Her rapid‑fire coloratura is phenomenal, delivered with great technical precision bordering on the ferocious, with a tendency to attack just a little too hard. Breathy pianissimos will not be to all listeners' tastes, possibly sounding too affected, though they often colour the vocal line sensitively. She still exercises tremendous control over her trills and her dark mezzo is well suited to much of the material here. The opportunity to discover music from operas I'd never heard of ‑ indeed, composers I'd never heard of ‑is well worth taking, especially when delivered with such exuberance and panache. Diego Fasolis draws vigorous, zingy playing from I Barocchisti, with a prominent role for strummed lute and theorbos. The recording (made in Switzerland rather than Russia) is bright and forward, bringing these rarities vividly to life. This is a triumph for Bartoli and a triumph for Decca, loyally supporting its super‑diva in yet another fascinating project, lavishing it with a beautifully produced book, excellently documented and illustrated. It's a shame that there's no explanation of the arias' contexts, but full texts are provided. The historical information contained within the hard‑cover book in the form of essays and time‑lines is invaluable. 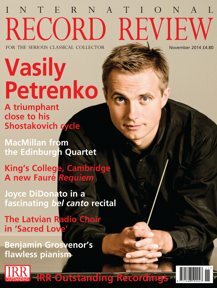 Anyone who claims the classical music recording industry is in terminal decline needs this issue as a reality check.